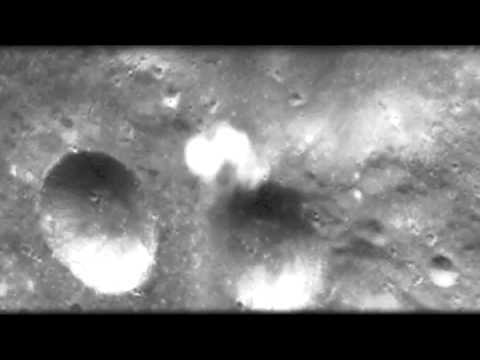 UFO SIGHTINGS DAILY: UFO Sighting of Craft Following Apollo 16 Module around Moon, Video. UFO Sighting of Craft Following Apollo 16 Module around Moon, Video. UFO Sighting of Craft Following Apollo 16 Module around Moon, April 1972 NASA footage. While exploring NASA's image atlas for the Apollo 16 mission, I came across 458 images that have a glowing white cloud UFO on the far left of the panoramic image. At first I was skeptical and took a closer look at the craft noting that the shape of the UFO changed shape several times. It is unknown if the cloud is a cloak for the craft or the cloud is the craft, but one thing is for sure, it moves fast and matched the speed of the Apollo module. This UFO was clearly following and monitoring the Apollo 16 module as it flew in orbit around the moon taking photos. Please notice that the UFO moves from the top of the photo and matches its speed with the Apollo module then at about 450 photos it begins to fall behind, apparently realizing that the Apollo craft was no threat. Also there were about 40-45 images that had a 100% focused cloud in its location and each of these images are slightly different than the next, not to mention that the lunar surface below the UFO changes in each photo the Apollo 16 module took. I (SCW) took all 458 still images and put them in movie format with each showing once per second. The movie starts with a close up of the UFO and then half way through shows the UFO in the full NASA panoramic photos.